Actress Alyssa Milano was blasted on social media following an inflammatory tweet about “Make America Great Again” hats over the weekend. Milano, who is also a liberal activist, likened the MAGA hat to the white hoods worn by members of the Ku Klux Klan. “The red MAGA hat is the new white hood,” she wrote in a tweet, referencing a clip from a video of a confrontation between Native American Nathan Phillips and Catholic school students. In the video, one student could be seen standing still and smiling while the Native American leader drummed in his face. Students later said they were confused about what the activists were doing and said they’ve faced death threats due to the hostile media coverage. 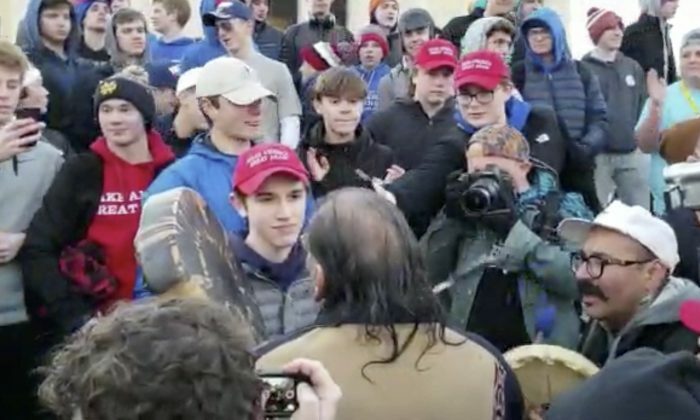 Many of the students were wearing “MAGA hats.” In the video, captured in Washington, they were involved in an encounter with Native Americans and Black Hebrew activists. “Who told you that? Fake news CNN?” another person asked her. A number of pundits, celebrities, and news outlets accused the high school students of being racist after a video surfaced of the incident. However, a longer version of the video then emerged, showing a far more complex scenario. Yesterday I had one impression of the maga kids from Kentucky. Now after seeing more videos I have a different more complicated impression. Makes all the hot takes seem silly. Due to the intense media scruitiny, Covington Catholic High School closed for safety reasons on Jan. 22. “I never interacted with this protester. I did not speak to him. I did not make any hand gestures or other aggressive moves. To be honest, I was startled and confused as to why he had approached me. We had already been yelled at by another group of protesters, and when the second group approached I was worried that a situation was getting out of control where adults were attempting to provoke teenagers,” Nick Sandmann, the student in the viral footage, said in a statement. “I believed that by remaining motionless and calm, I was helping to diffuse the situation. I realized everyone had cameras and that perhaps a group of adults was trying to provoke a group of teenagers into a larger conflict. I said a silent prayer that the situation would not get out of hand,” he continued. Phillips said Sandmann was in the wrong. Concurrently, President Donald Trump pilloried the mainstream media’s coverage of the video. “Nick Sandmann and the students of Covington have become symbols of Fake News and how evil it can be. They have captivated the attention of the world, and I know they will use it for the good – maybe even to bring people together. It started off unpleasant, but can end in a dream!” he wrote. Zachary Steiber contributed to this report.